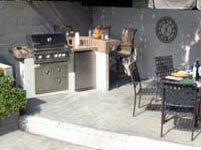 These days, pre-fabricated grill islands are emerging everywhere; you can find them at pool and spa showrooms and even at your local home improvement stores. 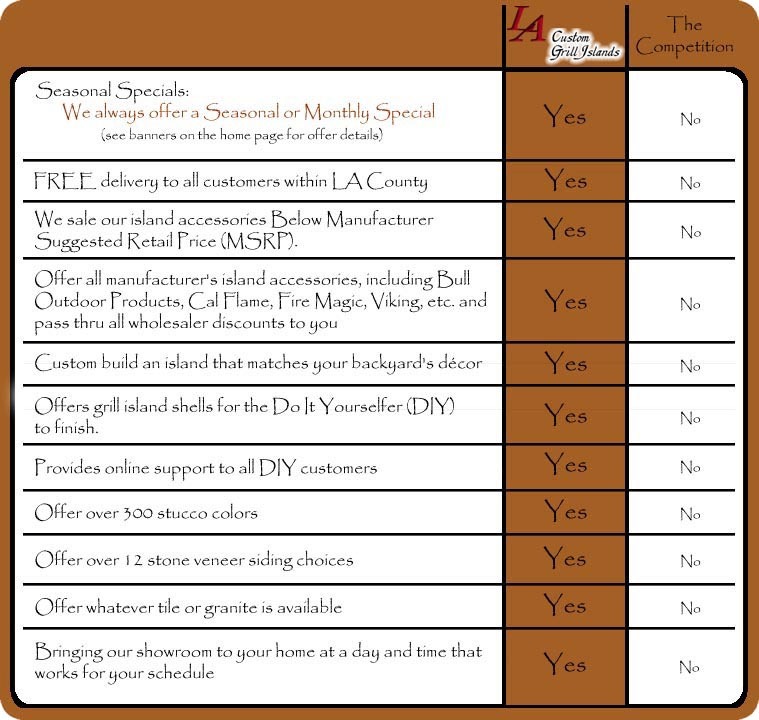 LA Custom Grill Islands works with you to custom design and setup an island that is less expensive than a pre-fab one and has the accessories that best fit your grilling needs. Why spend thousands on a pre-fab when you can have a custom island for the same price? "My wife and I special ordered a BBQ island from a well-known BBQ store and when it arrived, it had to be craned over our house which ended up damaging our driveway. To top it all off, the island was not built to the specifications that they gave us, so after a few weeks of trying to get them on the phone, I finally had to write them a few threatening letters that "persuaded" them to take the island back since they told me that they could not build an island with the original specs. I wish they would have just told us that in the beginning." "That's when I called LA Custom Grill Islands. Brock met with my wife and I and he listened to what we wanted along with our concerns. He then designed an awesome BBQ island to custom fit our backyard area and for the same price as the much inferior island. Brock and his crew were very professional and built our island in 2 pieces that they then completed in our backyard without the need for a crane. 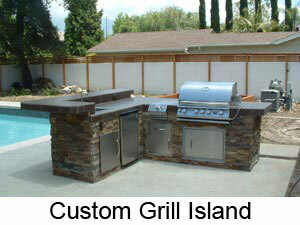 My wife and I are now very happy with our custom BBQ Island and would highly recommend LA Custom Grill Islands." Each island is hand build to fit your space, budget, and lifestyle. Deliver fully assembled islands faster than the competition. Use the highest quality materials to last for years to come. 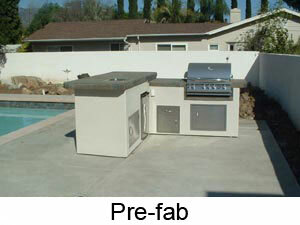 Plus, we repair and facelift existing grill islands right at your home. 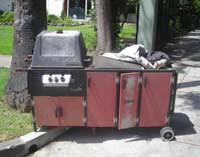 Replace accessories - grills, drawers, and access doors. Repair damaged islands - cracks, holes, and tile countertops. Island facelift - we can apply a new coat of stucco with over 300 colors to choose from. In some cases, we can even add additional accessories to your island. Get the backyard of your dreams today. * Delivery fees may apply outside the Los Angeles area. * New islands must be purchased through LA Custom Grill Islands to receive 5% off our website island accessories. New customer must mention the additional 5% off on island accessories when the quote is written, price adjustments will not be given any time after.